Power sanding can help cure endgrain tearout and can even be used for final shaping of the workpiece. This sanding system is easy to use, saves time and will give you superior results. The Power Lock System consists of a holder, made of rubber, with a specially designed plastic hub at its center that allows a sanding disc to be changed in seconds. The sanding disc is mounted by pushing it onto the hub then twisting clockwise 1/4 turn. To remove the disc, simply rotate it counterclockwise and pop it out of the hub. The Power-Lock Discs are made of a tough resin bond aluminum oxide, are cloth backed and will hold up to rough sanding situations. 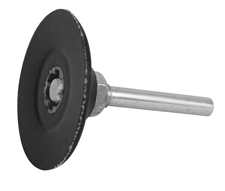 An 8" long extension mandrel is available as an option for use with the 1", 2", and 3" holders. This allows the turner to reach into the interiors of deeper bowls, vessels and boxes. Each Starter Kit includes: one PL Holder and 5 discs each of 60, 80, 120, 180, 240 and 320 grits. We also offer a 1-2-3 Starter Kit, which provides a full sampling of the Power Lock System, including: 1", 2" and 3" Power Lock Holders and 5 discs ea. of 60, 80, 120, 180, 240, 320 grits (90 Discs total). in 1", 2" and 3" sizes.